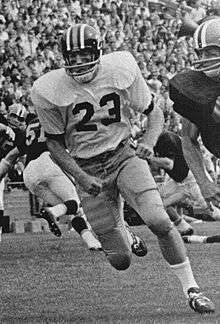 Roger Wehrli (born November 26, 1947) is a former National Football League cornerback who played his entire 14-year career with the St. Louis Cardinals from 1969 until 1982. He was a seven-time Pro Bowler after playing college football at the University of Missouri, where he was a consensus All-American and a first-round draft choice by the Cardinals in 1969. He was elected to the Pro Football Hall of Fame in 2007. Wehrli was born in New Point, Missouri. His parents were teachers and his father was a school district superintendent. They enrolled Roger in school at the age of 5. As a result, he started his freshman year of high school at the age of 13. Missouri Hall Of Fame Coach Richard Flanagan's (HS Coach @ KC) said of that Wehrli was the best player he ever coached—that when he got the ball he could move like no other and could anticipate the other players move before he did. In 1965, Dan Devine recruited Wehrli from King City, Missouri, where he lettered in football, basketball, and track for the Wildkats, as well as help the school win the state title in track in 1965. Wehrli was assigned to defense by University of Missouri coach Dan Devine. Despite playing on defense, Wehrli was able to get his hands on the ball often enough to be an offensive threat. Wehrli was a two-time All-Big 8 player and was the Big 8 Defensive Player of the Year as a senior. That same year, he was a unanimous All-America selection. Roger had ten career interceptions, with seven coming in his senior season, also returning kickoffs and punts. In 1968, his 40 punt returns and 12-yard return average led the nation. To finish off an 8-3 season, Wehrli had a decisive interception to help lead the Missouri to a 35-10 victory over the University of Alabama in the Gator Bowl. At the time of his College Hall of Fame induction he held school records for career punt returns, punt return yards in a game, season, and career. He played in the Senior Bowl and was named to the 50-year Anniversary All-Senior Bowl team. Wehrli was a member of the first class of inductees into the Missouri Sports Hall of Fame, located in Springfield. He was elected to the College Football Hall of Fame in 2003. Wehrli is the 13th person with ties to the University of Missouri to be inducted into the College Hall of Fame. In 1990, Wehrli was voted a charter member of the University of Missouri Intercollegiate Athletics Hall of Fame. Wehrli's outstanding attribute was his speed. Originally expected to be taken in the third round, he ran a 4.5 40 yard dash and vaulted into the first round. Hall of Fame quarterback Roger Staubach has called Wehrli the best cornerback he played against, and claims that the term "shutdown corner" originated as a description of Wehrli. In his career, Wehrli had 40 career interceptions for 309 yards and recovered 19 fumbles. He was elected to the Pro Football Hall of Fame in 2007. When inducted into the Pro Football Hall of Fame, he became the second Missouri player to be elected, joining former tight end Kellen Winslow, who was enshrined in 1995. Wehrli was inducted into the Cardinals Ring of Honor on October 14, 2007. An All-Rookie choice in 1969, Wehrli was voted All-Pro in 1970 and was a consensus All-NFC selection including being voted to the Pro Bowl. In 1971, Wehrli was 2nd team All-Pro by the NEA and again was a consensus All-NFC choice and was selected to his second Pro Bowl. In 1972 Wehrli was moved to safety by the Cardinals coaching staff where he played alongside Hall of Famer Larry Wilson. He returned to right cornerback in 1973. In 1974 Wehrli was again All-Pro and he made his third Pro Bowl and was a consensus All-NFC selection. The following year, 1975 though 1977, he was a consensus All-pro and consensus All-NFC player and a Pro Bowler. In 1978 Wehrli's only post-season honor was being honorable mention All-NFC by UPI as his Cardinal team struggled under new coach Bud Wilkinson. In 1979 Wehrli had a fine season and was a consensus All-NFC pick and made his seventh Pro Bowl. In 1981, after 12 seasons as right cornerback (except for 1972), Wehrli switched to the left side. In his first start at the other corner, he broke up two passes and made four tackles as the Cards shut out the Buffalo Bills, 24–0. In his 14 seasons, Wehrli played in 193 games. In addition to his starting defensive back duties, he was the holder on the place-kicks. In that role he scored a touchdown in 1982 on a fake field goal. ↑ "Cardinals All-Time Team: Cornerbacks – Roger Wehrli - '69-'82". Revenge of the Birds blog. SBNation. August 1, 2009. Retrieved 2016-06-17. ↑ Miklasz, Bernie (2007-02-04). "Hall of Fame for Wehrli? Roger that". St. Louis Post-Dispatch. Archived from the original on 2007-02-07. Retrieved 2013-12-01.